More Crazy to the people! When I see a plate built by 4 shades of beige (white bread, potato mash, brown sauce and a steak) I have to admit, I get panicky and wish I had some sprouts in my handbag. And oh, sometimes I actually do… Many of us are so used to the limited amount of colour in our diets that the lack of it is not even visible to us. Ah, well, onto today’s recipe where I went crazy with the beetroots. Let me present: Pink tarts filled with creamy spinach and topped with curly beets. By now I know you are oh-so-aware that a plate á la 4 shades of beige is not abundant in nutrients. I mean sure, if you cooked the organic potato with kindness and used sourdough bread instead of super white toast it would all be different. So let´s BE different, let´s treat our gorgeous body with some superhero respect (so worth it) and throw in some pink tarts and Grinchen green spinach while we´re at it! These tarts are a result of me craving the spring sun (a longing soon going overboard) and when grey days like today come along I just have to keep fooling myself by putting colour explosions in my mouth. Also I wanted to show that prepping Raw Food can be ridiculously easy and when you have a few tricks up your sleeve nothing really stands between you and those fresh veggies, baby! I have grown many a Beetroots in my life. Some of them red like these but some of them have been yellow (my favourite) and some striped. There really is no end to the imagination of Mother nature! Anyhow, regardless of their size, shape or colour – let´s all agree, these roots are real geniuses! Beetroots are a part of the Chenopodiaceae family and sisters and brothers to vegetables and herbs like Quinoa, Swiss chard and Spinach. So gather your family and have a picnic because this dish is actually a family reunion! When talking about beets and nutritional value, their blood and liver cleansing abilities are most commonly mentioned. But beets are so much more! 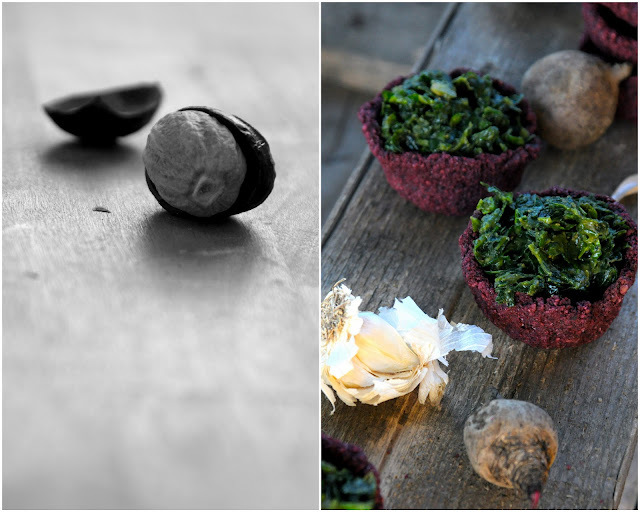 For starters they are an amazing source of fiber and not just the beet, their green tops too. In Chinese medicine beetroots are used to balance the hormonal system and are thought to be a cure for nervousness – Nice! I need to say a few words on oxalic acid here since both spinach and beetroots contain a load of it. As you might know our delicate calcium metabolism is inhibited by excessive amounts of acid (think chocolate, tea, coffee) and since the veggies in this post are abundant in oxalic acid you should not be eating them too often. Do you have a problematic/sensitive kidney? Try restricting oxalate-rich foods and it might just get better! Curious about the spinach? 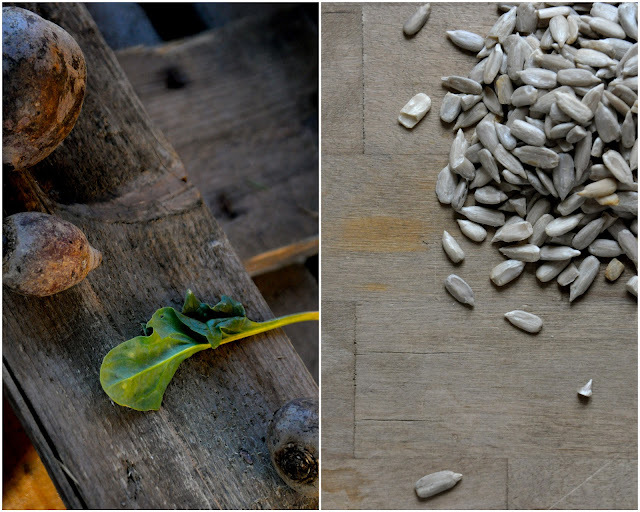 I wrote some good stuff on spinach in a post over at Green Kitchen stories, check it out! For this recipe you can use whatever seeds or nuts you like or swap the beetroots for parsnip, carrot or any other veggie. This particular time the crust happens to be raw and portion sized but you can choose to bake it in the oven in a regular pie pan if you wish. I used soaked and dehydrated sunflower seeds for this recipe but you can go ahead and use regular dry ones if you want. 2. Add the rest of the ingredients and mix again until it forms a smooth dough. 3. Divide dough evenly into 7 portions and form each portion into a ball that you press onto pan of choice (or press all the dough onto a larger pan). Bake in the over or dehydrator*. *If using the dehydrator, put cling film between the pan and the dough. You want to easily be able to flip the dough out of the pan after 2 hours of dehydrating and let it dehydrate without a pan/mould for 8 hours or until completely dry. Cooked in creamy spinach is quite common in Sweden but this recipe takes less time, is Vegan, Raw and way more appealing to your cells! 2. Cut open the avocados and scoop them out into the bowl of spinach. 3. Add the rest of the ingredients and massage it all (with clean hands!) until soft and creamy. 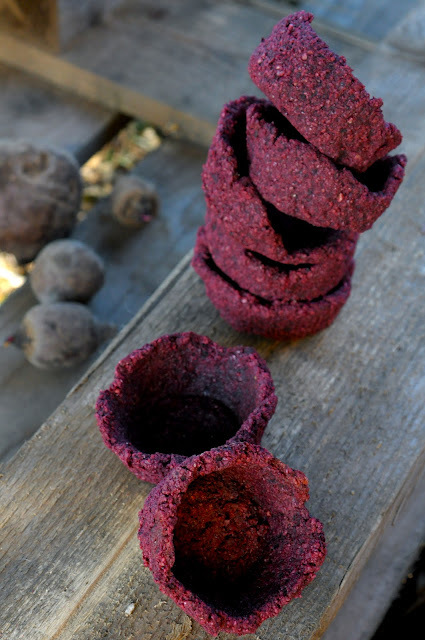 Peel one large beetroot and use a spiralizer, potato peeler or julienne peeler to make some crazy curls. I´m hoping this is my last slightly confused ”is it winter or spring recipe” (fingers crossed) and that you dare challenge the beige status quo of the food industry. Like I said; More crazy to the people! Also, I´m beyond blissed out by your sweet, encouraging and curious comments lately, both here, on Twitter, and on Facebook. I love chatting with you all, Earthsproutlings!